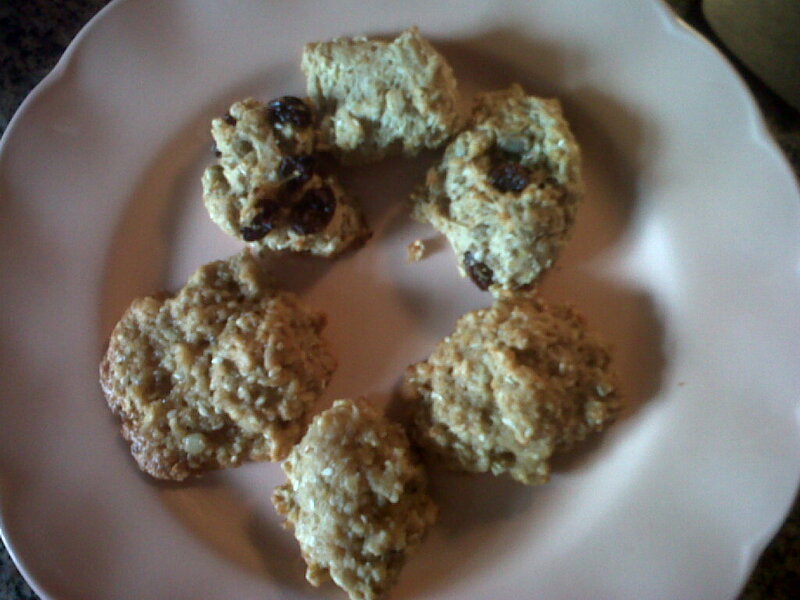 The original name of this recipe was “healthy” Quinoa cookies. With 1 1/2 cups of brown sugar I had some resistance posting the original with the label of “healthy”. In being very aware of the issues surrounding labeling and the level of deception that something is “healthy” (like the fat free yoghurt that indeed when you check the back has 2 grams of fat) I needed to do some tweeking. As well, knowing what I know about sugar now and its affects on the body, it’s not just about the scale and waist line. I was looking for something that people (including myself) could have in their pantry for a daily “little smackeral” of something. Something that wouldn’t spike the blood sugars, something that was fairly healthy and nut free that my kids could take in their school lunches. Yes I am one of those moms that seriously hasn’t bought store bought cookies or granola bars for years. In getting in the kitchen yesterday we made three batches of the Quinoa cookies. The original and a truly healthy version. THAT’S IT. Just 2 simple changes and the “healthy” value of the cookies escalated! After tasting the dough before it was baked I noticed that it was, well, a little plain; that’s when I added the raisins. I would add another pak or possibly two of stevia. OR perhaps even soak some raisins overnight in just a little water then make a puree paste sort of mixture to use in place of the the plain water. They will, as you notice in the picture, cook and look a little different to each other. As I said the taste of the “healthy” version was plain, what I meant was “clean”. You can taste the grains and seeds and not have an overpowering of sweetness. Guys, I am the sort of the person that could, if it was a perfect world, have a chocolate bar or two a day. The really cool thing is that once you start to get rid of high-glycemic foods you DON’T want them, crave them. Food tastes better and you feel better not to mention your healthier because of it. The other simple little note is: we actually made 3 batches; 2 of the original ones and 1 of the healthier version. In cooking all the quinoa together I looked at the pot and thought “oh ya now how am I going to measure this out?” Make bigger batches, the quinoa comes out to 1 1/3 cups of quinoa per batch. *cook quinoa ahead of time, measure out and store in zip bags in the freezer. As I enjoy one (well two) of these with my morning java, I have a level of peacefulness in knowing that I can now share, enjoy and call these truly “healthy Quinoa Cookies”!